I thought I’d exhibit this here, since it will never be used. If it makes anyone laugh then the time it took me to create it hasn’t been wasted! I know it looks uninspired, but I probably would have used it if the print on the back had been okay. The flask and champagne glass are supposed to represent Serge and Leo. 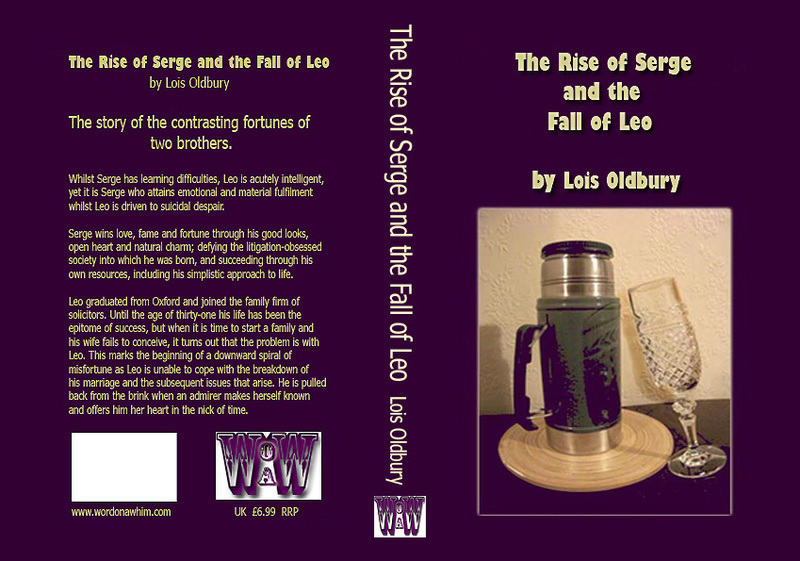 Serge has an attachment to thermos flasks and keeps one with him at all times, and Leo has had a life of celebrated success until his world falls apart. A shattered champagne glass would have been more appropriate but I was not prepared to break the glass for the sake of my art. Well, I did consider it, but was worried about the dog’s paws – and it would probably have broken all wrong; either shattering beyond recognition or just snapping off at the stem. I expect anyone who knew what they were doing with Photoshop would have used separate images of the flask and champagne glass and overlaid the glass over the flask at a more dramatic angle. I simply put a coaster under the edge of the glass to tilt it as far as possible without it falling over! I emailed the jpeg file to my chosen printing firm, Imprint Digital, asking is they could print it off on paper to see if the small print looked readable and they were good enough to print in on card and post it to me the same day. I was most impressed with the quick and helpful response from Imprint Digital, but it confirmed the doubts I had about the quality of my file, as the writing was still blurry and pixelated despite the high-spec printer. I was no longer able to blame my tools. Now I am glad that the print is blurred, otherwise I would have made do with it, and it’s really not very good, is it? I think it looks really good…apart of course from the blurring…shame that…maybe some hours spent on photo shop would improve it, then I have not tried anything like this…you have a talent there Lois. What ever you decide on the cover it will have its own charm.